Avery Dennison introduced a new portfolio of Fasson® Wash-off labels (at left) to help brand-owner customers cut the enviro impact of their products by maximizing opps for materials recycling. Suitable for both glass and PET bottles, the wash-off labels can be a simple and immediate replacement for any existing wet-glue product, Avery Dennison says. The multilayer construction consists of a polypropylene film for clarity, a PET liner and a proprietary wash-off adhesive formulated for easy removal when washed in industrial brewery washers. 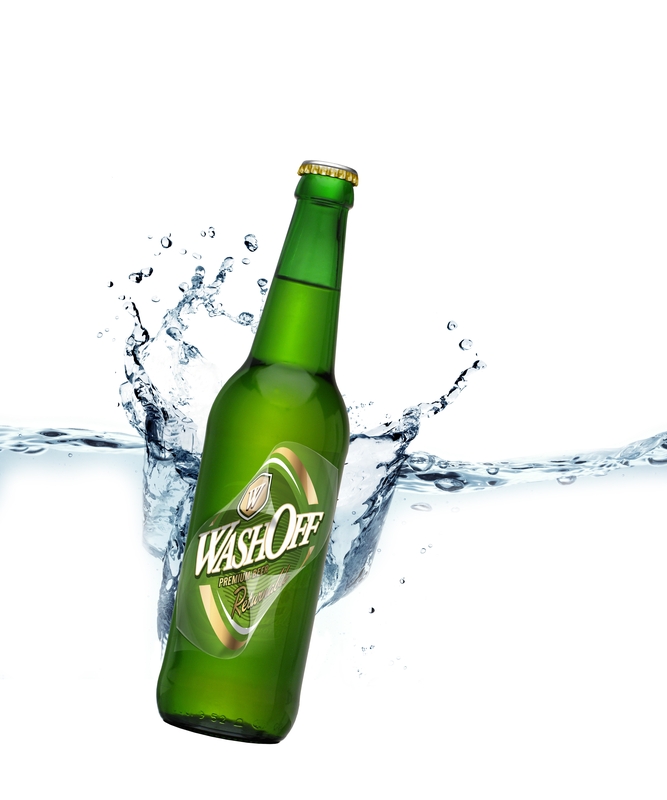 The wash-off labels are said to leave no adhesive residues on the bottle, nor in the washer, nor any label marks or “ghosting” on the bottle. The labels also wash off from 65 deg C, allowing for lower washer temperatures. Avery Dennison also featured its new TurnLock™ Laminating System (at left), a patent-pending technology that allows converters to produce protected graphics with 30% less material and 25% greater operational efficiencies. It basically ends the need for an overlaminate or transfer tape. By using common print techniques and a turn bar, what previously took two rolls of material now takes only one. The TurnLock’s four steps: 1) Printing: images and text are reverse-printed on a single roll of film facestock; 2) De-laminating: the printed film facestock is de-laminated and webbed upward toward the turn bar while the adhesive/liner continues on a lower web path; 3) Turn bar: the film facestock is flipped so the reverse print is now in a positive orientation; and 4) Re-laminating: the film facestock is re-laminated with the adhesive/liner in the lower web. Currently available in North America only, TurnLock will be distributed in additional regions soon. FLEXcon collaborated with Wausau Paper to develop what is reportedly the first post-consumer waste (PCW) release liner for the narrow-web label market. Although the concept isn’t new, the technology hasn’t been available to make a PCW product equivalent in performance to a paper liner made from virgin fiber. Wausau’s Eco Select RT™ has30% recycled PCW with Forest Stewardship Council-certified fiber. The new liner, meant to be an alternative to FLEXcon’s SPEC 50K-8 liner, will become the release liner for THERMfilm® NEXgen™ gloss, top-coated polyester films. The Eco Select RT is said to have tensile strength, uniformity, smoothness, caliper consistency, density, opacity, layflat characteristics and release levels of standard liners. And of course, the used PCW release liner is itself again recyclable through existing program. DUNMORE Corp. demonstrated a new label coating that endures high heat and chemicals in harsh environments. The polyimide film is said to resist yellowing in heat up to 300 deg C, doesn’t break down while submerged in petroleum—oil, gasoline, transmission fluid, etc.—for four hours, and fits labeling apps for auto and aircraft parts, and circuit boards. Such high-durability labeling is in great demand with the advent of non-lead solder that requires hotter solder baths to melt. Previous coatings yellowed in high-temperature baths. The resulting loss of contrast between the background and the printing affected the accuracy of bar-code labels on circuit boards for devices such as smartphones and tablets. Neenah Paper’s new Secure™ authentication label papers incorporate a chaometric overt security feature integrated in the paper and authenticated via Prooftag’s patented verification system. This security solution gives each label, tag or seal a unique fingerprint for authentication. A random-fiber orientation in the paper provides an accessible solution to counterfeiting and forgery, Neenah Paper says. How does it work? Secure authentication labels are printed with a unique identifier (QR, 2D or alphanumeric code), which is matched with the random embedded-fiber image. The end user then verifies the code’s authenticity and corresponding fiber image via a smartphone or other device along the supply chain. Appleton launched Résiste 185-3.3 to its portfolio of direct thermal label facestocks. Developed for retail weigh-scale apps, the substrate features darker images and barcodes when printed with retail weigh-scale equipment, faster cash-register throughput and improved readability. Increased resistance to mechanical scuffing helps labels remain legible and scannable when in contact with PVC wrap, packaging films and bags containing plasticizers or where labeled items are stacked in cold cabinets. UPM Raflatac offered a laundry list of labeling materials. 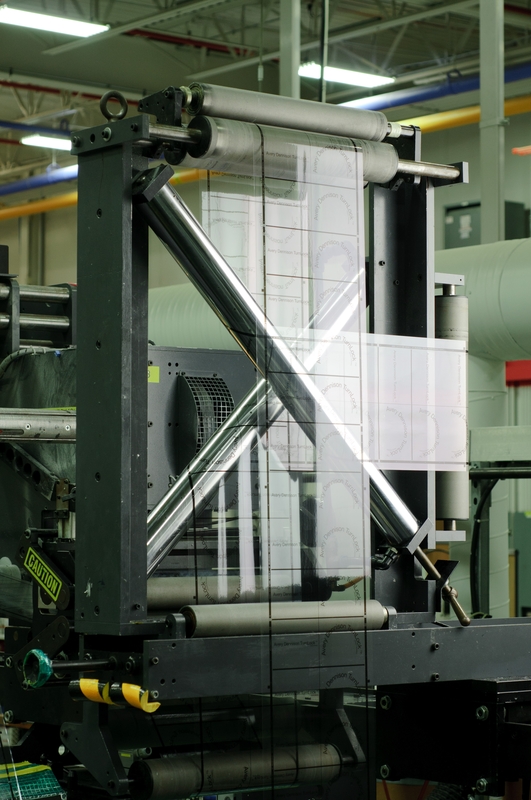 Among its developments: print-on-demand paper and film products that dry instantly on press after inks are applied; paper-faced shelf markers and talkers; a comprehensive range of VIP films; and new labeling solutions for pharma, security, durables and tire applications. It highlighted the company’s new Label Solutions Center in Fletcher, NC, which provides converters with cutting-edge technology and expertise to develop custom products. Dow Corning displayed new flat-release Syl-Off® Advantage Series solventless, silicone release coatings said to reduce the potential for web breaks after diecutting and during label dispensing. The paper coatings offer very flat, stable release profiles coupled with the cost-effectiveness of low-temperature cure at low platinum levels. New Syl-Off® emulsion film coatings can help converters optimize release performance, operate more profitably and reduce reliance on solvents. These thermal-cure materials reportedly deliver low and stable release profiles that add value to finished products, along with the potential for low coatweights that can be applied in-line to PET as well as off-line. And Dow Corning® 7651 and 7652 adhesives support the conversion of protective films for mobile device, touchscreen and flat-panel display apps. This entry was posted in coating/laminating, labels, paper/paperboard/cartons and tagged converting, environment, Labelexpo, labels, paper, plastic film, recycling, source reduction, sustainability, technology. Bookmark the permalink.